In treating of the Culture or the Vine, in New South Wales, it may perhaps appear superfluous to many of your readers to offer any remarks upon the subject of climate. Certainly it would be difficult to find a climate more propitious than that of the County of Cumberland, and, indeed, of the whole coast, from Illawarra to Morton Bay. Nevertheless, it is equally certain, that within 100 miles of Sydney, numerous sites exist, offering every natural advantage essential to the production of a wine of reputation, save this first of all requisites. The great elevation of many portions of the inland districts, must, I fear, preclude all hope of their ever producing wine for their consumption. Over a still larger extent however, in which the cultivation of vineyards has not, that I am aware of, been hitherto attempted, they might be established with every prospect of success. Their climate, it is true, is not comparable for this purpose to that of the coast; but how vastly superior to that of even some of the most renowned wine districts of Europe! In every one of our inland counties, from the Murrumbidgee northwards the elevation does not much exceed 2000 feet, situations exist in which the vine would flourish, if the proper varieties were selected and well managed. What a source of saving and advantage would it not be to the inhabitants of Yass, Goulburn, Berrima, Bathurst, &c., did their respective districts produce wine sufficient for their own consumption, And what exists to prevent it? No natural obstacle certainly; nothing but apathy or want of information. Wherever the climate is warm enough for the successful cultivation of the earlier or dwarf varieties of maize; wherever the peach or the fig can be made to bring their fruits to complete maturity, without the assistance of walls, there must be situations warm and sheltered enough to ripen the fruit of the vine. There are varieties of grapes in the colony well adapted for cold and elevated sites; some of them are cultivated in the best vineyards of Europe. I shall point out several, which I have had the opportunity of noticing, when I come to treat of this part of the subject. The sites recommended as the best, by all writers upon the vine, are the sides of gently sloping hills, sufficiently elevated above the valleys or plains, to be beyond the influence of the hoar frosts of Spring, and the chill humid exhalations occasionally prevalent in such situations. The first may, in a single night, frustrate the hopes of the cultivator by cutting off the young shoots, and the last always greatly retard the maturity of the fruit, and are at times, otherwise prejudicial. In the interior of the colony it will be advisable to pay scrupulous attention to this point, that nothing may be neglected which can contribute to the perfect maturity of the crop. Towards the coast, these precautions may be less rigorously observed; nevertheless, it is important not to overlook them. I know two vineyards in the same neighborhood, one in a valley or plain, near stagnant water, the other on the side of a hill, at an elevation of from 100 to 150 feet. The crop in the latter is ripe usually three weeks or a month earlier than the crop in the former. In the low situation much damage was sustained during three successive seasons from hoar frosts, (on one occasion so late as the 8th November,) and the late-ripening varieties of grapes with difficulty attain complete maturity: whilst on the hill, the frost has never been known to affect the young shoots, and every variety of grape attains early and certain perfection. In Europe, some of the best vineyards are situated on the sides of very steep hills. On the banks of the Rhone, for instance, the vineyards which produce the delicious wine called Côte Rôtie are situated on such abrupt slopes, and have of necessity been formed into terraces so narrow, supported by such high walls, that from the opposite bank of the river, they literally have the appearance of gigantic flights of steps. The cultivation of these abrupt hills must very expensive. Nothing but the high prices obtained for their produce could enable the proprietors to continue it. The vineyards which produce a large portion of the best wines of Bordeaux, are said, on the contrary, to be situated in an extensive plain, many of them upon gentle undulations rising out of marshy ground: nay, the “Palus,” a tract of rich alluvial land, on the right bank of the Garonne, near its confluence with the Dordogne, and formed by the inundations of these rivers, is remarkable for producing a wine of great body and full flavour. But, although the crops in the “Palus” are generally much more abundant than those of the adjacent hills, they are said to be more frequently damaged by spring frosts, and to be some times altogether cut off. These instances of the successful cultivation of the vine in such situations are to be considered in France, rather as exceptions to a general rule. The plain or low situation must generally be objectionable here for the causes above mentioned; the abrupt hill also, both on account of the great outlay required, in the first instance, and the expense of maintaining it in proper cultivation. In this climate, subject as it is to tremendous bursts of rain and to long droughts, every slope planted with the vine, however gentle, ought to be terraced. If the inclination be rapid, greater for instance than one foot in 5 or 6, the expense of forming the terraces would be discouraging, and without the soil would soon be washed away by the heavy rains; whilst, in long droughts, the plants would be deprived of a proper supply of moisture. Were I to choose a situation for a vineyard, it should be elevated from 100 to 300 foot above the neighboring plains or valleys, open to the rising and meridian sun (unless in parts of the colony very subject to spring or early summer frosts, when I should choose a full northern aspect), sheltered either by wood or rising ground from the violent land winds, but in itself of very gentle inclination. I should not desire a greater slope, for instance, than one foot in 30 to one in 80. I shall hereafter point out the method I consider to be the most advantageous to adopt in forming a vineyard on a hillside. The most favorable aspects for the vine in this colony, are those from east to north, and in the colder and more elevated regions, even round, perhaps, as far as north-west, but sheltered as much as possible by the ground or by thick wood from the south south-east round to the north-west. In the county of Cumberland, I should prefer a north-eastern aspect, sheltered from north north-west to south south-east. As it is rarely that one can meet with a site comprehending every advantage, I shall content myself with observing that the great object is to have the vineyard open to the full rays of the meridian sun, without being exposed either to hot winds from west and north-west, or to any of the strong land winds, usually more or less prevalent in the spring. Violent winds are apt to break off the young shoots when they have attained from a few inches to two or three feet in length, and besides tearing the young leaves, may produce great damage at the periods of the flowering and the ripening of the fruit. It is not advantageous, however, to have any sheltering wood within thirty or forty yards of the vineyard unless it be a low hedge, or shrubbery of moderate height. The state and temperature of the atmosphere is of great importance to the Vine, particularly at certain seasons. Abundant rains, during the latter part of the Autumn and the Winter, may in this colony be considered favorable, so also are occasional moderate mild rains, until the fruit begins to swell to maturity. In the Spring, the great evil to be guarded against is the hoar frost, which sometimes occurs late in low situations, even in the county of Cumberland, but much more frequently as we advance into the interior. There is a very simple preventive, which every person possessing a vineyard in a situation exposed to Spring frosts, should be prepared to adopt. Twice this season (on the 4th and 19th October) has a vineyard which is under my observation, been preserved from extensive damage by the precaution. Small heaps of straw, rather damp, and mingled with a few shovels full of loose earth are placed in readiness at intervals of six or eight yards, all round the vineyard, and as it is of some extent, along some intersecting cart-ways. A dray load of this short straw may, perhaps, be divided into from twenty to thirty heaps. It the thermometer and the appearance of the weather over-night indicate the possibility of frost, a vigilant look out is commenced an hour or two after midnight. As soon as the thermometer approaches the freezing point, or falls a little below it, a certain number of` the heaps of straw, say every sixth or eighth, are lighted; each is so managed as to be kept smouldering (which it is very easy to effect by the admixture of earth, or by sprinkling a little over it), for about an hour. Of course a dense smoke is produced, the state of the atmosphere preventing it from rising or dispersing. As they burn out, fresh heaps are lighted, taking care to reserve a sufficient number to produce the densest smoke, from sunrise to an hour after. By these simple means, either the dew is prevented from freezing upon the tender shoots of the vine, or if they are frozen, the sun’s rays are prevented from acting upon them, until the slowly increasing warmth of the atmosphere has thawed them. At the vineyard above mentioned, on the morning of the 19th October, the thermometer fell below the freezing point soon after midnight, and was at 28 degrees or 29 degrees about sunrise; no damage was done to the vines, although potatoes not more than two hundred yards distant, were quite cut off. High Winds, as I have already observed, are very injurious at all times. The tender shoots of some varieties of vines are apt to be blown off by them, before they are long enough to be tied to the stakes. Violent winds sometimes also prevent the fecundation of the flower, and are said to greatly retard the ripening of the fruit. Cold rains, at the period of the flowering, are also likely to render a large portion of the blossoms abortive. A single day of cold rain in Europe, at this period, sometimes cuts off one-third of the crop; but a mild warm rain immediately after the flower has passed, is supposed greatly to favour the setting of the fruit. During the period of maturation, which in this country lasts usually from five to seven weeks, it is desirable that the temperature throughout the twenty-four hours, should be as uniform as possible. At this season, as well as in the spring, the advantage of a moderately elevated site is experienced, the variation of the temperature being much less than in low grounds. It should not be forgotten that the maturity of the fruit is more accelerated and, more uniformly regular, (a very important quality) in a situation favored with a moderately high temperature, as well by night as by day, than where the range is much greater, although the average of the twenty four hours is as high or higher. The damp cold which, in low situations, at night or rather towards the morning, succeeds the burning heat of the day, is certainly unfavorable to the quality of the produce. Rain, in any considerable quantity, rarely fails to produce injury, sometimes to a very serious extent, during the period of maturation, but some varieties of grapes are much more susceptible of being damaged than others. I shall point out these peculiarities at the proper place. A few hours of mild moderate rain, about a week or ten days before the fruit is quite ripe, is considered to be very advantageous; it hastens the maturity of the grapes, improves the quality, and increases the quantity of the vintage. The excessive heat which occasionally prevails during a hot wind, sometimes causes extensive damage to the bunches of grapes which are exposed to it, but this evil rarely, if ever, happens if the vines have been properly managed, as I shall shew when I come to the heads of planting and pruning. The varieties of black grapes, after they have changed color, are, as might be imagined, more susceptible of injury from this cause than the white. The severe hail storms, which sometimes ravage whole districts in their devastating track, are of course destructive in the highest degree to the hopes of the vigneron. Even showers of smaller hail may be productive of very extensive damage. The blow inflicted by a hailstone, even of moderate size, is apt to bruise the tender fruit, which frequently either shrivels up in consequence, or decays, and not infrequently, in stages more advanced towards maturity, may communicate rottenness to the remainder of the bunch. With the exception of climate there is no point of so much importance, in determining the site of a vineyard, as the nature and quality of the soil; and where the climate is congenial to the grape, the choice of a proper soil may be said to outweigh all the other considerations put together. Nor is it to the mere surface that attention should be directed: the subsoil is at least of equal importance, and should be examined to the depth of several feet. The fine quality of the wines of the “Palus,” near Bordeaux (as mentioned in the preceding paper), is attributed to a stratum of gravel and sand, 3 or 4 feet from the surface, the soil, which is superincumbent (a rich alluvium), being considered to be altogether unfavourable to the production of a wine of reputation. Strong tenacious clays and wet situations are unfavourab1e to the health of the plant. These should never be chosen. In almost every other description of soil, provided it be loosened to a sufficient depth, the plant itself will flourish; but it is only where there is a considerable intermixture of stone or gravel, either in an entire or decomposing state, that the better qualities of wine are, as a general rule, to be expected. No matter how poor and arid the surface may be let their be only depth sufficient amongst the stones for its long rambling roots to penetrate, and to a certain extent the vine will flourish, and probably produce a rich flavoured wine. I ought to observe, however, that light deep sands which either have no subsoil for a considerable depth, or which rest upon strong tenacious clay, are considered by the French to be unfavourable for the production of good wine. And it is probable that the same objection may, to a certain degree, extend to soils formed by the decomposition of coarse sandstone, such as we meet with round Sydney. Strong deep wheat lands are also rarely planted with vines. Although they produce abundantly, the wine from them, in France, is said to be almost invariably deficient in body and flavour. They are besides considered to be more profitably employed in the growth of grain and in other kinds of husbandry. Although the superior warmth of our climate may, to a certain degree, obviate the objections, which in less highly favored latitudes apply to this description of soils, it will be prudent not to disregard the experience of other countries not so favorably circumstanced. Two thirds of the vineyards of France are, it is stated, planted in soils that could not profitably be employed in the growth of any other species of agricultural produce, and hence, say the French, the particular value of this plant to them. With the exceptions above mentioned, it appears to matter little what rock or stone enters into the composition of the soil, provided only it be contained in a sufficiently undecomposed state to act as a drain to superfluous moisture, and to permit the roots of the vine to penetrate freely in all directions. To what particular property in these stony or gravelly soils, the favorable influence is to be attributed, does not appear to me to have been satisfactorily explained. It cannot be to mere permeability or facility of drainage, because it is evident that a deep sand must be equally permeable. Whilst, on the other hand, it is well-known that several of the most celebrated vineyards of the Rhine, being composed of various colored marles, more or less intermingled with stones (Johannisberger; Markebrunner, and the vineyards at Hockheim for instance), are of so tenacious a nature, that after rains it is not permitted to walk in them until the ground has to some extent dried, and that in long droughts they become seamed as it were with cracks. It merits observation, however, that the finest Mocha coffee and the choicest kinds of tea productions which, like wine, are valued for their aroma, are said to be grown on soils precisely analogous to those which are found to produce the best wines. An opinion has been put forth, and has become prevalent, that none but very poor soils ever produce the finer wines, and that the presence of calcareous matter is also absolutely necessary. I believe this to be erroneous in both instances. With respect to the first, it is very true that in climates, not naturally favorable to the vine, it rarely happens that, when planted in very fertile soil, there is sufficient warmth to bring the fruit to the requisite degree of maturity. The plant, acquiring an extraordinary state of vigor, is too much disposed to produce wood and leaves, and in the cooler climates of vineyard cultivation, the fruit is rarely or never in such case sufficiently provided with saccharine matter to make good wine. But the result may be very different in climates where the summer is warm and prolonged: witness the wines grown on the rich volcanic soils at the bases of Vesuvius, Stroinholi, and Etna; and those of Madeira. With regard to the last assertion, the evidence of all the writers upon the vine I have ever perused, is decidedly at variance with it, not to mention my own slender experience. All concur in pointing out calcareous soils as eminently favorable to the vine, and stating that they compose a very large portion of the vineyards of Europe. But this, by no means, implies that no others are favorable. In order that I may render this conclusive to the minds of your readers, I shall make one or two quotations from writers of the highest reputation. First: the author of the very able “Essai Statistique sur tous les Vignobles de la France,” after describing and classifying all the different kinds of soils says, “All the different kinds of soils we have just described contain more or less argillaceous earth, and often oxide of iron in small quantity, and upon all the vine is cultivated with more or less success. There is not one that does not produce a wine of distinction. Thus the wines of the Hermitage (Dept. de la Drôme) of Chenas, Condrieux, Fleury, Juliénas (Dept. du Rhône) are produced upon decomposed granite, as are those of St. Joseph (Ardéche) and those of Moulin-á-Vent, Torreins, and la Chapelle de de Guinchey, the best of the arrondissement de Mâcon. Decomposed schistus or shale produces the wines of Banyuls, Colliouer, and Port Vendre (Pyrénées Orientales) of la Malgue, arrondissement de Toulon, of Côte Rôtie, arrondissement de Lyon, &c., &c. A clayey soil produces those of the Palus (Gironde), particularly those Queyries, which are considered to be the best; also, the wines of Frontingan (Hérault.) To it also may be assigned the white wines of Bergerac (Dordogne), for the clay predominates over the calcareous earth in the vineyards which produce it. Pebbly or gravelly soils produce the renowned wines of the Medoc and the Graves of Bordeaux; the wine of Revesaltes (Pyrénées Orientales); and the Côtes du Rhône (Gard.) Sandy soils are generally less favorable to the quality of the wine; nevertheless, the wine of Cap-Breton (Landes) is produced in them. Calcareous soils are the most prevalent, and, without exaggeration, they may be said to support three-fourths of the vines of France. The exquisite wines of Burgundy and Champagne are produced in them, as well as those of a great number of other vineyards of considerable reputation”. And, a little farther on, the same author continues, “A light, dry, pebbly or gravelly soil, in which rains and dews can readily penetrate, and its roots extend themselves freely in all directions, is that which best suits the Vine, provided it is so situated as to receive without obstruction the rays of the sun. If the surface soil should be 18 or 20 inches deep, so much the better. Frequently, however, it has not a third or a fourth part of this depth, still the Vine succeeds, particularly if it is superincumbent upon a soft or decomposing rock, which the pick can, without difficulty, gradually reduce. In a soil of this nature, clover, lucerne, perhaps even sainfoin and certainly the cereal plants would not flourish Were it not for the vine, what would the Medoc and the Graves of Bordeaux produce? and what would be grown on so many other wretched soils scattered over the whole surface of France? Heath, or a little miserable herbage, scarcely fit for the browsing of sheep”. These authorities being, I should hope, sufficient to convince your readers that other soils besides those of a calcareous nature are well adapted for vineyards, I shall without further quotations proceed to point out many soils in this country which appear to me in a greater or less degree, to possess the requisites for the production of good wine. I shall also in some instances specify where I have observed them to exist, but in so doing, I cannot avoid expressing my regret that my acquaintance with the surface of the country is not more extensive. Hundreds, nay thousands, of the most promising sites for vineyards doubtless exist, which I have never seen. Your readers must therefore consider the following observations as applying solely to the limited tracts I have had an opportunity of examining, and not by any means as an attempt at a statistical account of the country at large, with reference to the capabilities of its soil for the production of good wines. I shall consider myself amply repaid for such trouble as I may have taken, should the perusal of these papers induce the fortunate possessors of any of these favored sites to study well the subject, and afterwards to devote a portion of their time and means towards converting them into, perhaps, the most valuable species of agricultural property which exists in the world. Commencing nearest to Sydney, the first description of soil I shall mention is prevalent to a considerable extent upon the chain of hills to the northward of Parramatta, extending from the neighborhood of Kissing Point, by the Pennant Hills, to Castle Hill, Baulkham Hills, Toongabbee, Seven Hills, and perhaps considerably farther. It is a light, free, blackish or brownish soil, lying over shale, generally with an intervening stratum of mild clay containing portions of iron-stone or shale. Wherever in this description of land the shale is sufficiently near the surface to admit of from 6 to 12 inches in depth being moved in the trenching, (for in no case would I recommend a hill to be planted with vines without deep trenching) and intermingled with the soil, it ought to prove very suitable. The greater the quantity of shale which is turned up the better, and I may observe that, to a certain extent, the deeper the surface soil is, the thinner the intervening stratum of clay, the less tenacious in its nature, and the more full of iron-stone the better. The next kind of soil I shall notice is a light red or brownish loam, resting upon a very thin stratum of mild red clay, with a very loose friable shale underneath, first of a light red color, but darker below. Many of the hills in the district of Appin abound with this soil; occasionally I have met with it without the intervening clay. I am sure it might be made to produce a fine wine. In the neighborhood of Mulgoa I have observed an excellent soil for vineyards; a considerable extent of light stoney land immediately overlying a loose shattery fine grained sandstone passing into shale. Upon this soil, one or two prosperous vineyards already exist, the produce of which, I believe, amply repays the spirited proprietors for their praiseworthy exertions, in acting as pioneers, I may say, to the surrounding inhabitants. Throughout many of the hilly districts of the county of Cumberland, there exists a reddish or brownish loam, resting upon a stratum of mild red clay, which gradually passes into a decomposing calcareous sand-stone, sometimes alternating with shale, and containing boulders or blocks of very hard blue or brown calcareous sand stone, which is occasionally traversed by veins of calcareous spar. This description of land frequently contains numerous small lumps of nearly pure carbonate of lime, intermingled with the subsoil. Where the stratum of clay does not exceed from twelve to eighteen inches in thickness, this will probably prove to be a fine vineyard soil. I have noticed a hill of this nature at Minchinbury, on the Western Road, and I believe there is a continued chain or succession of such hills along the Devil’s Back to Carne’s Hill, on the road between Liverpool and Camden, and from thence extending through Leppington, Varroville, and Denham Court, into the Airds and Appin districts; and similar soil exists in the Bringelly district, opposite Kirkham. To a smaller extent, another species of soil may be met with, consisting of a deep light red sandy loam, intermingled with very small iron-stone gravel, intermingled with ferruginous sand, and, at the depth of several feet, a stratum of clay. When the clay does not approach within three feet of the surface, this is certainly an excellent soil, both for quality and quantity of produce. The most fragrant wine I have ever tasted was made in the colony, from grapes grown in a soil of this description, and could such a wine be made to any extent, the fame of the colony as a wine country would be rapidly established. Bordering the Rivers Hawkesbury and Nepean, banks of very light sandy loam occur, of unknown depth, but at a few feet from the surface, becoming gradually less porous, and intermingled with ferruginous sand. These banks, though of alluvial formation, are no longer subject to be flooded, and besides being very porous, they are from their great depth tolerably fertile. They are very favorable to the growth of the vine, and yield large crops of wine of medium quality. I have known a produce of as much as twelve hundred gallons to the acre from a vineyard in such a situation. But it must be borne in mind, that such situations are in many respects less favorable to the vine than those of moderate elevation, although they are much less expensive to bring into cultivation, and are very suitable for raising wine for common purposes. Passing to the south, I may observe, that land admirably adapted for the growth of fine wines exists upon the flanks, and near the summits, of the chain of hills called Razorback, but their extreme abruptness would seem to forbid their conversion into vineyards, at least for some generations. The hill forming the highest point over which the road passes, at the further end of the Bargo Brush, appears, by the indications in several places where the road is cut into it, to be favourable for the vine. About a mile beyond the Kangaroo Inn, there is a small patch of land entirely composed of a dark red decomposing iron-stone. Were it situated in one of the wine districts of France, I have little doubt its produce would he a wine of some distinction. Near Mr. Cordeaux’s (Bendouli), a mile or two on the Sydney side of Berrima, I have noticed a hill, the subsoil of which has been used by the road party for metalling the road. It would probably prove to be excellent for a vineyard, and where could one hope to find a more favorable aspect, or a more promising site? Throughout the Sutton Forest country, the hills abound with sites and soils adapted to the vine, the former light, deep, dry, with stoney subsoils either of trap (whinstone) or iron-stone, and occasionally shale. Next we come to the Wombat Brush, with first its deep light red earth, formed from decomposing iron stone, and farther on, consisting of poor gravelly soil, abounding with fragments of quartzose rock and feldspar, more or less rounded by the action of the water. At Towrang, on the range of barren stoney hills, along the flanks of which the line of road to Goulburn has been conducted, are numerous admirable sites for vineyards. And moderately elevated as this range is above the neighboring valley of the Wollondilly, it is probable that spring frosts would not affect the vine planted in any of the various sheltered sunny aspects which offer themselves on its northern slopes. Beyond this, even to the other side of Goulburn, (and how much farther I know not,) are soils formed of decomposing pudding-stone, granite, lime-stone, schistus, &c., which offer so many of the most favorable indications for the production of highly flavoured wines, that the inhabitants of the south must indeed he blind to their own comfort and well doing, if they longer neglect to avail themselves of the advantages which nature has so bountifully placed at their command. Upon the Hunter and its tributaries I have observed many favorable sites, but particularly in the upper districts: in the lower districts, consisting chiefly of poor gravelly soils, formed of decomposed pudding-stone, and of a more fertile description from decomposed trap; in the upper, of decomposed trap, lime-stone, &c., but I am not sufficiently acquainted with this part of the colony to distinguish them more particularly. I can only repeat, that in choosing sites for vineyards, the strong tenacious clay sub-soils should be as much as possible avoided, however favourable may be the surface soil. Those clays, however, which are much intermingled with fragments of` stone, and which besides become friable after a few days exposure to the atmosphere, may be very suitable, especially if not of much thickness. Having now, Sir, naturally exhausted the slender stock of information I possess respecting the soils, well adapted for vineyards, which are to he found in various parts of the colony, I will only further remark, upon the subject of soil, that, in Europe it frequently happens, that although red wines and white wines of the higher qualities may be grown in the same neighborhood, they are seldom produced from the same vineyard. Indeed, an opinion prevails, whether founded on experience or not I am unable to state, that the same soils are generally incapable of producing both in perfection. It is even alleged by some authors, that deep-colored soils, whether from the presence of oxide of iron, or from any other cause, should be planted with red grapes, whilst those of very light color, such as chalks, light colored marls, or other light calcareous soils, are better adapted for white grapes. 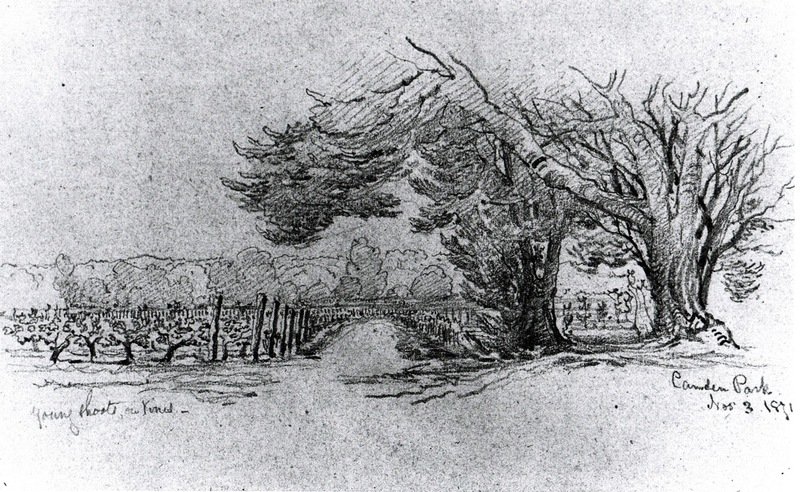 This Conrad Marten sketch is dated 1871. The flatness of the landscape and trees in the distance suggests the 2nd vineyard, close to the Nepean River although the date seems rather late for this.